When you’re an amateur or professional chef, it’s often difficult to gauge when a piece of meat is ready for the plate. You might press on its surface or even cut into the middle section for a visual perspective. There’s a better way to know when your food is safe to eat, however, by purchasing a meat thermometer. These specialized devices give you a precise measurement that’s within 2 or 4 degrees of a calibrated thermometer. When it comes to fighting off harmful bacteria that can quickly sicken you, a handy meat thermometer is a must for any household. Examine some of the traits that each thermometer has so that you can make an educated purchasing decision. The top pick in meat thermometers today is the Javelin PRO Limited Edition by Lavatools. This thermometer is more akin to a switchblade knife by appearances, however. You can take this thermometer on the road for that impromptu barbecue at the beach or over at a friend’s house. This product has so many features that professional cooks are even amazed at the design. With a price that’s slightly higher than $50, you’ll want to know more about this meat thermometer before you buy it. Once you see all of the fine features, it’s difficult to say no to this purchase. One of the first perks of this product is its color selections. You have seven colors to choose from, including chipotle, sesame and olive. It’s possible to match the thermometer to your kitchen’s color scheme. The color selections don’t contribute to the thermometer’s functionality, but they might make it easier to spot the item in your kitchen-tool drawer. You always want to have this thermometer handy for any cooking occasion. 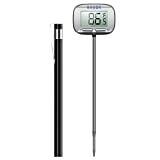 Most consumers are used to the basic thermometer where it’s a fixed probe with an attached display. The Lavatools product is different because it has a foldable probe. Quickly snap the probe outward whenever necessary and fold it back afterward. There’s no risk of bending or breaking the probe with this folding feature. Consumers have reported in the past that their probes never last very long because of their exposed and fixed position. Try the folding probe, and you’ll never want to use another design ever again. As you press the probe into the meat, the Javelin PRO software activates. Don’t worry about staring at the thermometer because it will indicate when it’s ready. A reliable alarm sounds when the temperature is finally steady. You’ll immediately know when the meat is ready for the table. You might wonder if you have time to perform other cooking tasks as the thermometer takes a reading. In fact, you barely have time to walk away from the probe because it’s designed to provide an accurate measurement after only 3 seconds. This rapid time doesn’t mean that any precision is sacrificed either. Specialized thermal sensors within the thermometer are tested and calibrated by the manufacturer before the product is released to the public. You have a reliable thermometer that can be compared to another product for verification purposes. 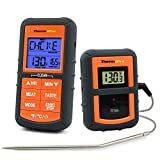 If you’re concerned about placing your hands close to a grill or inside the oven, you’ll love this thermometer’s lengthy design. The probe itself is 4.25-inches long, but it stretches out to 10.5-inches long with the help of the display housing itself. Your hands will almost be a full foot away from any hot surfaces as a result. When burns are common in your household, a long thermometer is also a safety tool. The lengthy probe also needs a display that’s easy to read too. Lavatools doesn’t skimp on the visual perks that the display offers every cook. It’s 2-inches wide with clear, digital numbers across it. Toggle quickly between Celsius and Fahrenheit if necessary. The display also has a backlit feature, which allows you to see the numbers in almost any lighting. Nighttime barbecues are no problem when you can instantly see the readings on the backlit display. When the thermometer isn’t in use, simply press it up against the refrigerator. It has a magnetic spot that holds it securely in place. The probe weighs less than 5 ounces, which is courtesy of the plastic housing. Lavatools makes the magnet large enough to hold the lightweight tool while allowing it to release with ease as you pull it off of the refrigerator. A feature that’s appreciated by every cook is the splash-resistant housing. Inevitably, grease will often spray upward when you insert the probe into any meats. Other thermometers might become damaged with just one splash. This issue might also occur when you try to wash off the probe. Lavatools created a durable product that allows for some splashing against the housing. Simply wipe it off and continue the probe’s use. The sealed housing may only be compromised if it’s submerged in liquid. Consumers should remember that splash resistant doesn’t mean that the product is waterproof. Consumers are often concerned about the battery within their digital thermometer. This product has a reliable, coin battery that’s included in the purchase. The battery will continue to last because you’ll only operate the thermometer for a few seconds at a time. In fact, the manufacturer advertises this product to have more than 3,500 hours of battery life. With so many features, this thermometer will probably be used every day during your cooking processes. Shut the thermometer off when its not in use, and you’ll have a tool that’s ready to power on during any meal-preparation period. 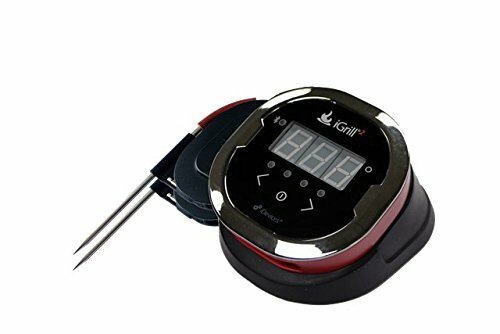 When grilling can’t get any better, you might discover the ingenious design of the iGrill2 Bluetooth thermometer by iDevices. With a simple, LCD screen and surrounding red accents, this probe offers your barbecue a quick-and-easy way to know when your food is ready. After setting this probe up at the cooking site, you can almost cook hands-free as you employ the latest Bluetooth technology between the thermometer and your smart device. Get to know this thermometer, and you’ll be tempted to cook with it every day of the year. The main attraction built into this thermometer is its wireless capabilities. Download the free app onto your smartphone or tablet, and instantly connect to the probe. You’ll be able to read the temperature and watch it in real time as the food heats up. Set up alerts so that you always know when your food is ready. These alerts are quickly set up in the app, and you can enjoy socializing between cooking chores. With this measurement device, you aren’t required to babysit the grill anymore. The real-time measurements and alerts are courtesy of the embedded Bluetooth components within the probe. Bluetooth is within almost every device sold today, including your smartphone and tablet. Enable your Bluetooth to “talk” to the probe, and you’ll have reliable connectivity. iDevices reports that their probe can connect within 150 feet of your device. This huge range is ample enough for any backyard or beach cookout. As you examine the thermometer’s exterior, make a note of the various ports dotting the edge. This product comes with four different ports that can measure four, separate meats simultaneously. You don’t have to constantly move a meat thermometer between different meats because you have a dedicated probe for each one. Simply toggle between the meats on your smart device, and you’ll see all of the necessary information. One drawback noted by some reviewers is the battery power. This probe is powered by a basic, CR2032 coin. Although these batteries have a long life, they can lose their charge over time. This probe doesn’t come with a backup charger, so it’s possible that you’ll have power issues at some point. You may want to keep a spare battery on hand in case of an emergency. Knowing the meat’s temperature is a crucial way to determine when it’s done and ready for the table. Look deeper into the app’s functions and note the meat choices. Use the thermometer’s preset values based on the type of meat. Each meat has a different, minimum temperature that must be reached before eating can begin. Choose “pork” on the app, and you’ll instantly know when the right temperature is reached. You can use a manual mode, but the preset values are based on government information that is extremely helpful for your overall health. For your convenience, the iDevices probe has a magnetic feature. Press it against your grill, and it sticks with a strong magnetism. Alternatively, use the adhesive disk that comes with the probe. Some grills today don’t have a traditional, metal construction. If you have problems using the probe on your grill, the adhesive will work on any clean and dry surface. Wipe down the area before you stick it on. Some consumers have noted that the Bluetooth connectivity isn’t as far-reaching as advertised. However, you should note that this technology is based on line-of-sight. The thermometer and your smart device need to be within visible range of each other. Walls and other obstacles will hinder communications between the two devices. With a good line-of-sight, your iGrill2 should work without any problems. At first glance, this meat thermometer looks more like it’s a pair of walkie-talkies than a simple probe. 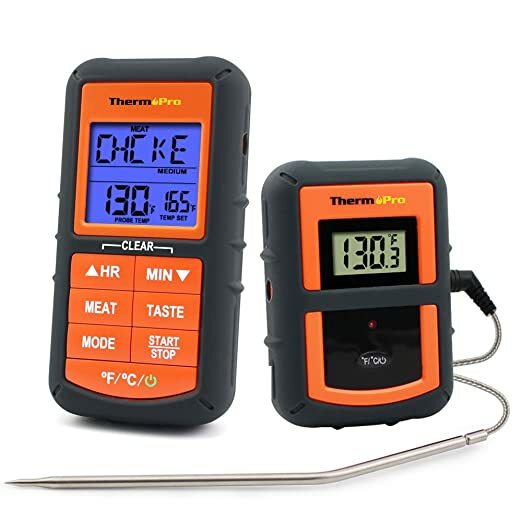 The Remote Wireless Digital thermometer by ThermoPro is a heavy-duty device that’s meant for those serious chefs. In fact, it’s not limited to just grilling situations. You can also use it in the oven for those large, family meals. Being aware of your food’s temperature is the best way to keep everyone safe from any illnesses. For an almost guaranteed healthy meal, discover the features within the ThermoPro today. When you buy this thermometer, it comes with a transmitter and receiver. Place the transmitter with the food, and carry the receiver up to 300 feet away. These devices aren’t using Bluetooth, but they employ basic transmission signals in order to communicate. As the meat reaches its safe cooking temperature, the receiver should react with both auditory and visual cues. You’ll always know when to remove the meat from the grill. Cooking can be a sport when you’re trying to balance the tasks out between entrees, sides and desserts. 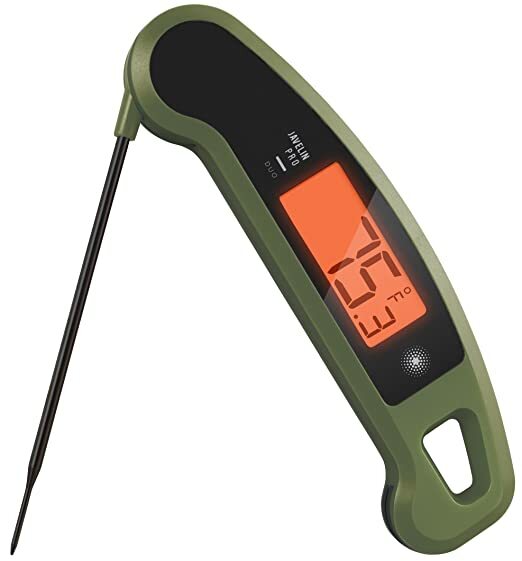 You might be quickly moving around the kitchen or backyard, so the probe’s manufacturer constructed their thermometer with rugged, rubber sleeves. Your hands might be wet or slightly slippery, but you’ll still be able to grasp the receiver without any problems. This sleeve also protects both of the units from any unexpected drops. The rubber provides some resistance against any damages to the units as you move about your cooking area. The ThermoPro device doesn’t have a basic LCD screen. In fact, it comes with three colors embedded in the components. As your meat warms up, the receiver lights up at various intervals. You’ll know when the meat reaches rare, medium and well-done by simply looking at the LCD color. Although you’ll still know the exact temperature with the numerical readings, the color-coding feature gives you even more versatility. The manufacturer designed the transmitter with a versatile wire that’s useful both indoors and outdoors. Use the wire on the oven door as you snake the probe into the hot, cooking area. Alternatively, alter the wire to work as a stand as you place it near your grill. Most consumers are pleased with the flexible use of this securing mechanism because the transmitter should be far enough away from the heat in order to preserve its internal components. The wire provides this service with ease. The probe itself is an astounding 6.5-inches long. Use it on any size roast, and you’ll have the most accurate cooking temperature. The long probe allows you to reach the innermost part of your meat. That location is perfect for the safest measurement because the meat’s exterior will heat up faster than the interior. It’s impossible to use a digital probe all of the time and expect it to work perfectly for many years. Some consumers have reported that their probe stopped working after only one year. In these cases, contact the manufacturer with your concerns. Although there’s no published warranty information on this probe, the manufacturer should support their customers with stellar service or repairs. A quality probe for less than $20 is usually a tough purchase to find, but Habor makes that need easy to fulfill with their Instant Read Digital thermometer. This probe is a stripped-down version of all of the other top picks, but it still offers the core information that you need about your meat. When a budget find is required, you’ll be thrilled with the Habor model. This thermometer can report readings as low as negative 49 degrees Fahrenheit and as high as 392 degrees F. For most cooking applications, this temperature range is perfectly gauged. 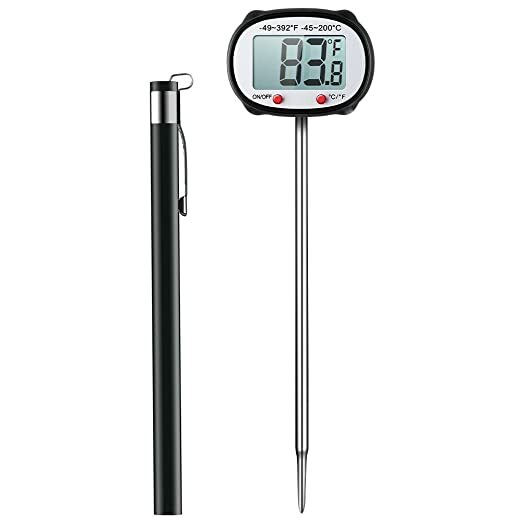 In fact, you don’t have to dedicate this thermometer to only grilling or roasting purposes. Use it with your favorite smoker, or go indoors and create some candy. This device can double as a candy thermometer, such as during fudge-making projects. Reviewers have mentioned that this probe has a clever design to its tip. It has a very narrow endpoint, which contributes to minor holes in your meat. You don’t want huge holes in your food because the juices will run right out of these areas. Tiny holes will still conserve some of the juices while allowing you to verify the right internal temperature. If you use meat thermometers on a regular basis, you know how frustrating it can be to read some products. The digital display might be faded or at a poor angle. Habor’s designers thought carefully about this issue and created a swiveling head. You can turn the head a full, 180 degrees so that the temperature is always at a good angle. Keep your face away from the heat as you simply turn the display to the side instead of moving your head into position. The manufacturer developed this swiveling head in order to keep you safe from any injuries. One feature that might be a concern for any user is the button sizes. This thermometer comes equipped with two buttons that allow you to toggle through different modes. However, these buttons are incredibly small. People with large hands or joint ailments may find the buttons difficult to press at times. You’ll need to take a look at this product so that you can make a decision based on your personal opinion. Save the device’s battery life with each use because this probe comes with an automatic-shutdown feature. If the probe hasn’t been used in the past 15 minutes, it will power down. As a result, you’ll always have ample battery power for that next grilling session. When your thermometer isn’t being used, slide the convenient cover across the tip. This cover prevents the probe from being bent or damaged during storage. The cover also has an attractive black hue that matches the readout screen. With a sleek look and low price, the Habor digital thermometer is a smart choice for all of your cooking needs. There’s no need for you to stand and stare at a meat thermometer that takes a few minutes to report a reading. Today’s meat thermometers are revolutionary when it comes to temperature-sensing technology. Thermistors, thermal sensors and other components operate within seconds in order to offer you the fastest and most accurate results. Rapid readings contribute to safety as well. You can place and remove the probe in a few seconds, which keeps your hands and face away from any flames or heat. Barbecuing situations, for example, can be very dangerous if you need to read a thermometer that takes a few minutes to complete its measurement. When it comes to digital devices, power sources are always a concern. Meat thermometers, however, use very little power for each reading. It was common in the past to leave battery-powered thermometers on while they were left in a drawer. The battery quickly died as a result. When you purchase your next thermometer, verify that it has an automatic shutoff feature. After a few minutes, the battery will cut off energy to the display. You won’t have to worry about battery power anymore. With most thermometers lasting for thousands of hours with one battery, you may never replace the power source during the product’s lifetime. You might have amazing vision, but your eyesight relies on the appropriate lighting to properly function. With that fact in mind, you need a meat thermometer with an easy-to-read display. Ideally, it should have a large, LCD display with only the temperature being offered. Thermometers that add too much information to the display, such as icons or other numerical data, can confuse cooks who’re in a hurry to complete their meal-preparation duties. It’s also helpful if the display is backlit with some natural light. An afternoon barbecue can still have some shadows as you gaze carefully into a grill. That backlit feature allows you to peek at the meat instead of exposing it and cooling off the grill simultaneously. Depending on the cooking situation, you may need to bend over or crane your neck to read a meat thermometer. The last thing that you want to do is subject yourself to a hot grill in front of your face. Look for meat thermometers with chimes or alarms as a solution. You insert the probe into the meat and allow it to perform its functions. When the temperature doesn’t rise anymore, the device will sound the alarm. At this point, you can take a quick look at the temperature. You only place yourself close to the heat for a few seconds, and you’ll immediately know when the temperature is perfect. Analog meat thermometers used to be your only choices in the marketplace when it came to temperature measurement. These products are still available today, but they take considerable time to report a measurement. In today’s modern world, selecting a digital thermometer is the way to go. Meat thermometers aren’t very expensive, and they provide you with years of accurate measurements. Simply store the thermometer with a clean probe after each use. Replace the batteries in a timely manner too. In most cases, you’ll have a tool that’s ready to go for that next barbecue or family dinner. No harmful bacteria can get past your thermometer.